Irregular shapes, unusual objects, picture frames or circular work are no match for this innovative new Bessey clamp. 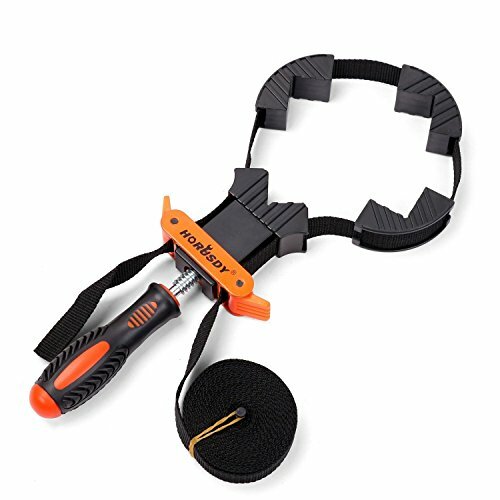 With a 23' long x 1" wide, high tensile strength polyester "no stretch" strap that winds up for safe and easy management, and four unique "vario-angles" that exert continuous pressure on the joints, this is more than just a strap clamp. Special winding gears at the head of the threaded spindle draw the strap evenly from both sides guaranteeing distortion free clamping. Additional vario-angles are sold separately in packs of six. Corner Clamp mainly for Picture Frame, Cupboard, Drawer or any odd shape, holding it Securely in place whilst enabling even pressure on all sides whilst the bonding sets. These are a 'must have' for any woodwork enthusiast. Ideal for use with square, round and irregular shaped work pieces , such as Box, Picture Frame, Barrel etc. They are designed for assembling picture frames, drawers, chair frames or other articles of various sizes and configurations prior to glueing or fixing. Tension is maintained by means of a handle which tightens the 4 metre long woven canvas strap linked to the tensioning unit. The corner braces can be removed if you want to use these on irregular shaped objects. 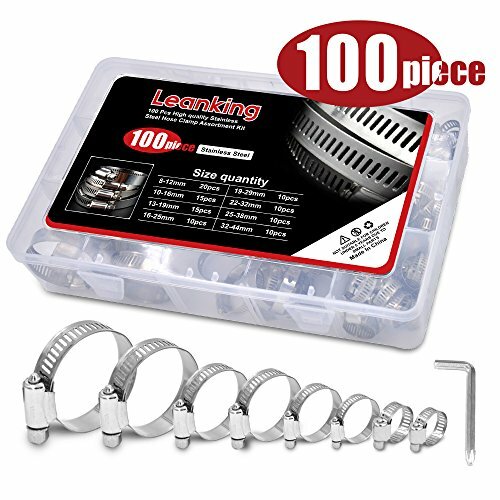 LeanKing Premium Stainless Steel Worm Gear Hose Clamps. Gives You a 5 stars reliable smart tools improvement. 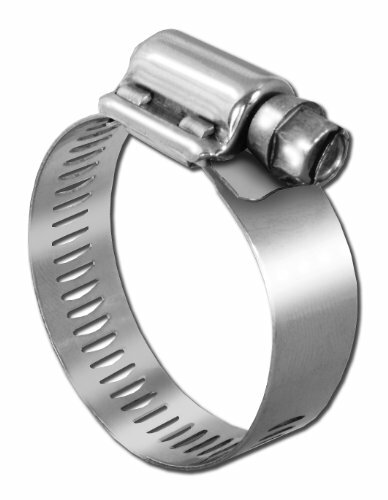 LeanKing worm gear hose clamps have all heavy duty stainless steel band, housing, and screw. Great quality provides resistance to corrosion. LeanKing hose clamps are flexible and ductile with wide adjustable size range. A worm gear mechanism adjusts the clamp's diameter to precisely apply sealing pressure. LeanKing hose clamps attach hoses for fitting hoses in confined spaces to prevent flow leakage. Easy to tighten or loosen for easy installation. They provide a great secure in hoses, pipe, cable, tube, fuel lines etc even in water salt circumstance. 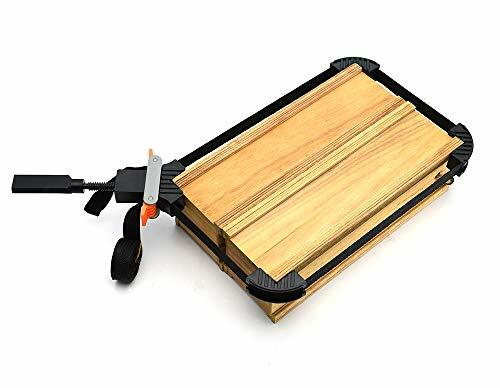 Hard plastic frame/jaws will not mar surfaces when tightening; Ensures accuracy and safety "
This ratcheting band clamp is perfect for carpenters and woodworking hobbyists to secure square or irregular work pieces! 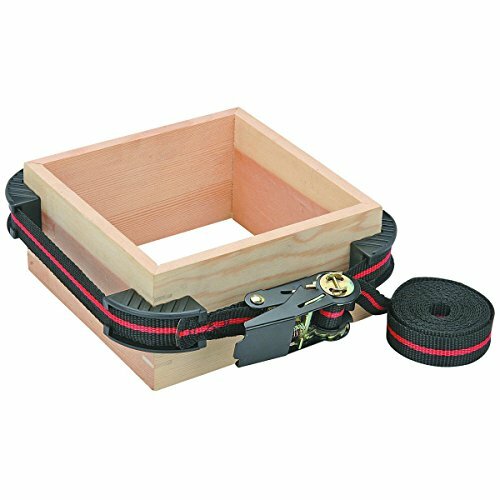 The four removable clamps on the ratchet strap ensure that your work piece has constant applied pressure and hold when using adhesives. This high quality ratcheting band clamp is a great tool for any shop or garage! 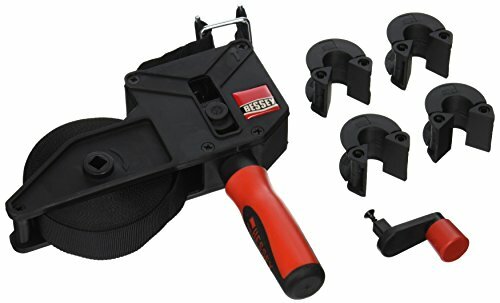 Heavy duty ratcheting mechanism locks in place four removable corner clamps tough polyester webbed band working load: 396 lbs. strap dimensions: 13 ft. X 1". 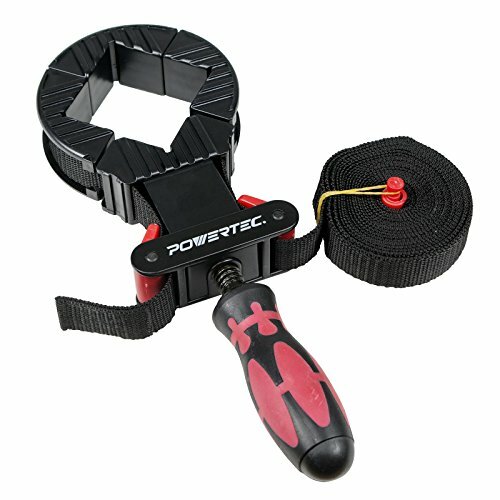 The POWERTEC Deluxe Band Clamp with Quick-Release Lever is ideal for use with square, round and atypical-shaped stock. This versatile clamp offers two layers of adjusting capacity. First the quick-release levers will customize to your workpiece, assuring it is firmly held in the position and configuration that you desire. Secondly, the convenient hand screw allows for further tightening and adjusting. This handy device provides even, firm and steady pressure on your workpiece while it's plastic jaws will not mar your stock surfaces. 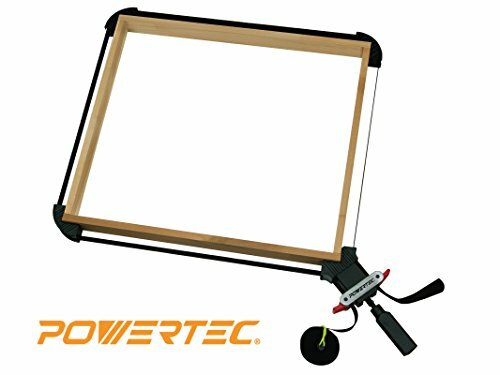 Features a generous band size (of 1- Inch wide x 13-foot) and a durable construction (of high-strength nylon webbing), which allows for a multitude of applications. Perfect for use with boxes, frames, barrels, etc. Durable, Streamlined, ultra-practical!. 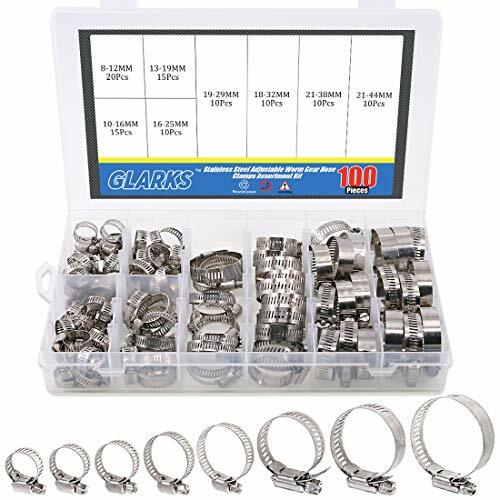 Glarks 100Pcs 304 stainless steel sdjustable 8-44mm range worm gear hose clamps assortment kit Specification : Product Type: Worm gear hose clamps Material: 304 stainless steel Band Range: 8-44mm / 0.31-1.73inch Product Feature : 304 stainless steel, corrosion and acid resistant, will not rust and break. Screws are adjustable so that you can adjust the size according to the diameter of the pipe. Attach the hose clamps on hoses pipe joints to prevent liquid leakage for saving your time and money. widely used in securing hoses, pipe, cable, tube, fuel lines, perfect for automotive, industrial, marine, shield, household. 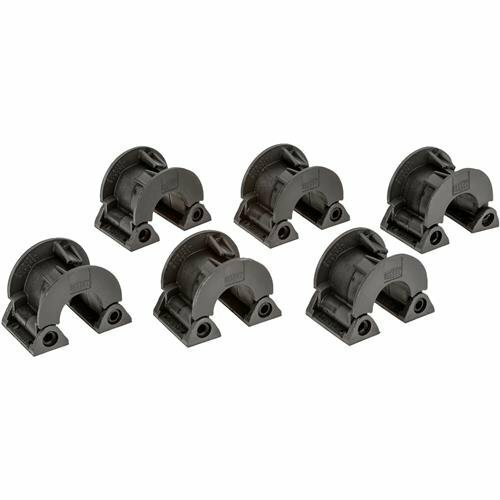 Package Detail : 8-12mm (5/16 - 7/16 inch) ---------- 20pcs 10-16mm (3/8 - 5/8 inch) ------------ 15pcs 13-19mm (1/2 - 3/4 inch) ------------ 15pcs 16-25mm (5/8 - 1 inch) --------------- 10pcs 19-29mm (3/4 - 1-1/8 inch) ---------- 10pcs 18-32mm (3/4 - 1-1/4 inch) ---------- 10pcs 21-38mm (13/16 - 1-1/2 inch) ------- 10pcs 21-44mm (13/16 - 1-23 / 32 inch) -- 10pcs Total Quantity: 100Pcs Note : Please check the specific size of the product according to the second picture. Due to manual measurement, there may be errors, please don't mind. If you have any questions, please feel free to contact us and we will try our best to help you. 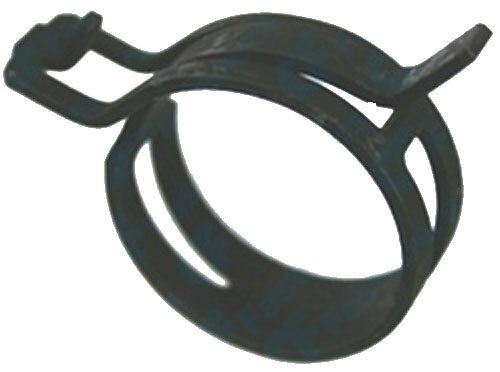 Wide Hose Clamp Size: In this Set, The range of clamp we provide is 8-44mm, that is 20pcs 8-12mm, 15pcs 10-16mm, 15pcs 13-19mm, 10pcs 16-25mm, 10pcs 19-29mm, 10pcs 18-32mm, 10pcs 21-38mm, 10pcs 21-44mm total 100pcs packed in a plastic box, easy to storage and carry. Durable Quality: All the hose clamps including the band, housing and screw are made of 304 stainless steel, with high performance of corrosion resistance and acid resistance, they are strong and durable, when installing on the pipe, you will no longer worry about them rusting and breaking. Adjustable Style: All the hose clamps with screws, you can adjust the size according to the diameter of the pipe, clamps are flexible and ductile, so you can install and remove them at any time. The range of clamps represents the minimum and maximum sizes they can be adjusted. 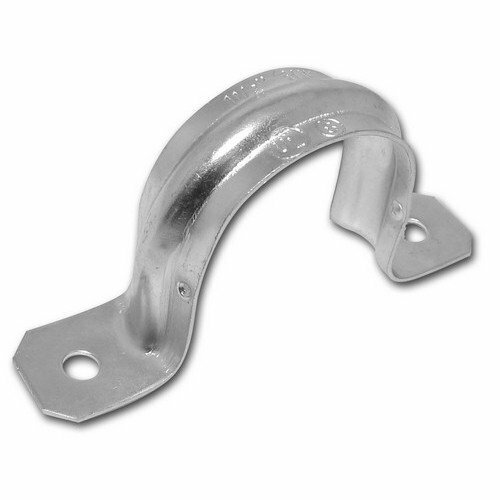 Save Time and Money: These stainless steel hose clamps can be attached on hoses pipe joints to fittings to prevent liquid leakage, saving your time and money on costly repairs the pipe. Function and Use: These clamps are locking secure and tight, widely used in securing hoses, pipe, cable, tube, fuel lines etc. Perfect to apply for automotive, industrial, marine, shield, household etc. These Extra Angle Clips Are For The G4955 Band Clamp. This Item Is Manufactured In Germany. This Item Belongs To Clamps. VIGRUE high quality spring clips for hose air hose, water pipe, automotive fuel line, silicone hose, etc. 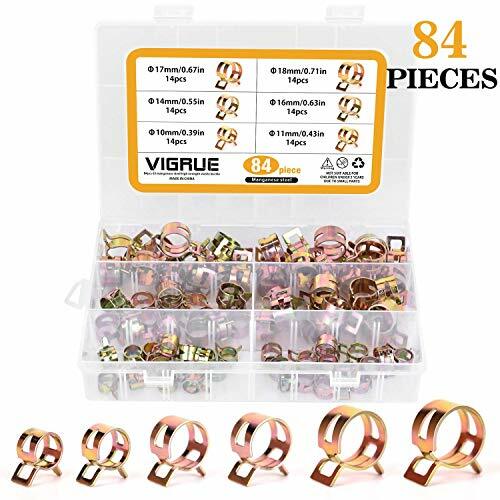 Package Quantity: total 84pcs are packed in a sturdy convenient case, can be used for a storage box, to be a great organization for you. Application: these fuel hose clamps can be applied for automotive fuel lines, small engines, air hose, water pipe, silicone hose, silicone vacuum hose etc. Life Time Warranty: New replacement or refund without return in 90 days; If there is any quality problem, please feel free to contact us, we will reply to you in 24 hours. 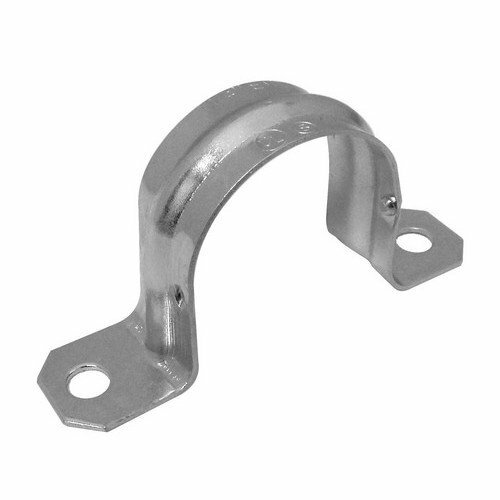 2 Hole Rigid Pipe Straps - Heavy Duty - Steel - Secures Rigid & IMC Conduit. 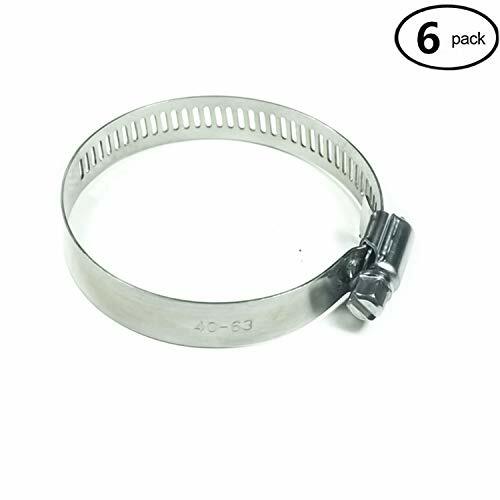 5 Constant Tension Band Hose Clamps 1-15/32" - 1-3/4"
Pro Tie heavy duty worm drive hose clamps are precision made from stainless steel to provide dependable and long lasting use. The 9/16-Inch wide band provides a larger clamping surface for higher pressure applications and works with a variety of hose materials. The slotted hex head bolt allows for multiple tools to tighten the clamp. All stainless steel construction provides superior corrosion resistance. Pro Tie hose clamps will work on a variety of applications from home use, auto repair, marine, plumbing, farm, ranch, and industrial. Fit Hose Diameter: 40-63mm (1-1/2" - 2-1/2"). 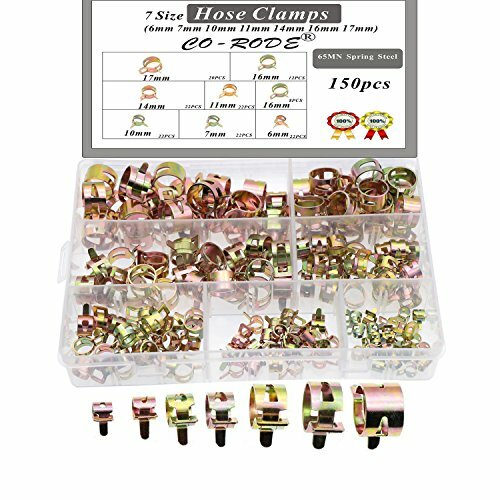 Hose Clamps Width: 12 mm (0.47 inch), thick: 0.6mm.